Old Man Lester had a farm. He did, not you. You have a bunch of sweet, adorable bunnies that want to eat all the delicious vegetables our hardworking farmer planted. It’s not fair, I know. 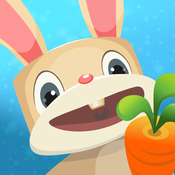 But can you say no to the adorable bunnies in Patchmania? Ups: Patchmania is a clever, addictive puzzle game. You job is to create a path to help the adorable bunnies get to their homes. While collecting all the vegetables they love on the way. You have four different bunnies to help, each one with its own characteristics, and likes. Over 600 puzzles to complete in this level-based game. And 9 beautifully designed environments to go through. The controls are extremely intuitive. You don’t even need a Tutorial to get you started. And you don’t need to play more than a couple of levels to be instantly hooked to the game. Downs: If becoming really complicated, really fast is a flaw, then this is probably the only flaw Patchmania has. Because, bare in mind: although it’s all cuteness at first, it is as big of a challenge as it is cute. It’s all nice and easy, when you start playing. You don’t need more than a couple of seconds to complete each puzzle. Then, you are kind of waiting for the free hint to pop on the screen to know which way to go. Then, you move on to using the limited number of clues you have. Then, before you know it, there’s a real maze on the screen, you need to guide more bunnies per level, your head spins, and it feels like you’re solving a math equation rather than playing. Buy some more clues, or keep on struggling? That is the question. What can you spell using just four letters? All the words you need to win Four Letters, the game. How is that for a challenge? 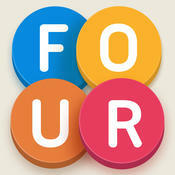 Ups: Four Letters is a really cool, smart game. You have four letters, and you need to use them to form a word as fast as possible. Four Letters doesn’t only test your word-forming skills, but also just how good you work under pressure. It’s a fun and fast game that will definitely put your mind at work. An amazing time waster for a lunch break or a ride home with the bus. Or do you think you can last longer than that before the time is up? Downs: Four Letters is a cute, engaging game that can be an even bigger hit with just a couple of extra-options. Like being able to compete against friends, and see which one of you can find the words faster. Or have boosts you can unlock after reaching a certain score, which you can use to increase your time limit, and get an even bigger score. Or an endless mode to play, and practise for as long as you like. If you’re thinking about starting the week with an adventure-packed, sword-fighting journey, then you’re in luck: this is exactly where playing Stormblades will take you. 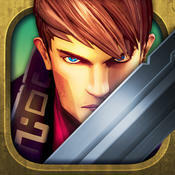 Ups: What I like most about Stormblades is that it is a simple, easy to play, yet catchy game. You don’t have to collect all sorts of stuff that you later have to combine, trade, and ultimately get lost in an overcrowded Options Page, while trying to figure out exactly what you should be doing with every item you have. No, Stormblades is as simple, and as focused on fighting, as it gets. Your job is to guide your hero through the ruins, while fighting the legendary Keepers. The game is level-based, so, as you clear missions, the opponents get faster, stronger, and better equipped. But also, with every level you pass, your hero’s weapon is upgraded, turning him, as well, from a novice to a real warrior. Automatically, naturally, without you having to perform all sorts of trades, and purchases. Stormblades is all about fighting. Downs: The downside of having to do just one thing throughout the game is that it might, at some point, turn into a sort of rut. However, that didn’t bother me so much. After all, it is a battle-based game, so you kind of expect fighting to be your main focus. I, on the other hand, missed having life bars. As you hit your enemies, you can, indeed, see how much damage this causes. But when it comes to the damage you receive while being hit, you have absolutely no clue about it. You don’t know how much life your have left, you don’t know how much life your opponent has left, and this, ultimately leads to not knowing when you should use a life potion, and when it would be a good idea to just hang around a bit more, since your opponent is closer to death than you are. So, yes, strategy is definitely not something to describe this game.